Home » guardians of the galaxy , han solo , humor , marvel cinematic universe , peter quill , Saturday night massacres , smokey and the bandit , star wars » New SATURDAY NIGHT MASSACRES battle: Han Solo vs. Peter Quill! New SATURDAY NIGHT MASSACRES battle: Han Solo vs. Peter Quill! The first epic matchup of Saturday Night Massacres ended this past weekend. With 62% of the vote Robin Hood decisively out-archered Katniss Everdeen for the rabbit dinner! Not a bad way to kick off this bi-weekly battle across the multiverse. Big and Little Enos must get the shipment to the big rally for Zaphod Beeblebrox. Unfortunately taking Coors outside the Solar System is bootlegging and highly illegal. And Bandit's rig is strictly two-dimensional. The Burdettes have no choice but to cut deals with two seasoned pros in the art of stellar smuggling. First to deliver their cargo of beer to Zaphod in less than 24 hours wins the cash!! 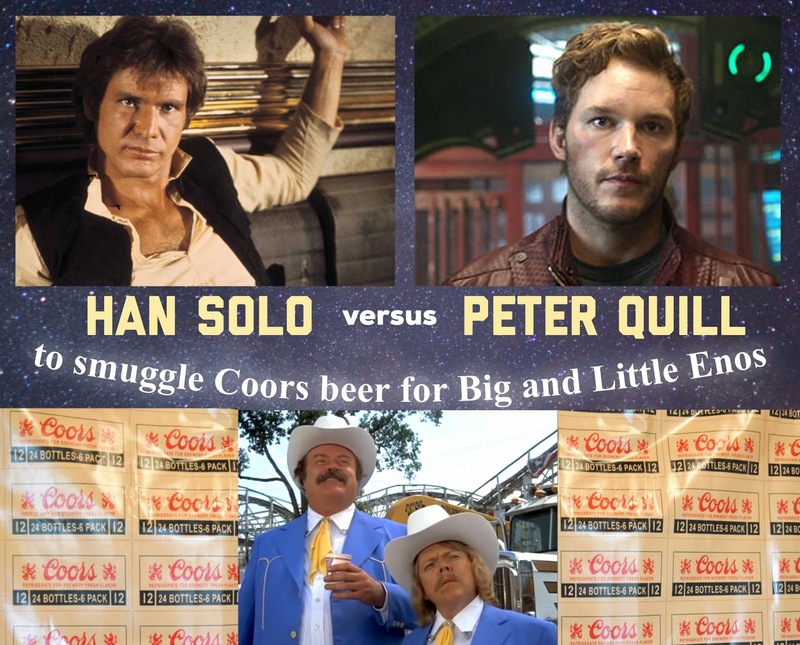 That's right folks: Han Solo and Peter Quill are taking it to the starlanes to see who will get their shipment of Coors beer to Zaphod Beeblebrox. Big and Little Enos Burdette are taking no chances. Too bad that Bandit's rig is limited to the continental United States and can't even get much outside the southeast much less past the orbit of Mars. But one way or another the illegal suds are going to get to Zaphod's big party.